That was certainly the only reason I’d heard of it Nant Gwrtheyrn since moving to Wales. However, as I soon discovered, it also has a Heritage Centre, Café, Conference Facilities and Self Catering Cottages, amongst other things. As I also found out on arrival, it’s a very popular wedding venue. Or, at least I think it is. On approach from Llithfaen, we climbed over the hills in the car and spotted a sign for the car park. Nant Gwrtheyrn does ask that, if you can, you refrain from taking your car down into the village itself, so that spaces are left for residents and, presumably, also wedding guests. However, if you do leave your car in the main park, be prepared for a very steep walk. It’s not bad on the way down as it’s, well…downhill. It’s a totally different story on the way back up, though. As I write this three days later, I can still feel the ache in my calves. That’s always the sign of a good walk. It’s around a 1-1.5 miles down (I’m guesstimating here, so don’t come back and shout at me if it’s longer) and takes around 20-30 minutes. Helpfully, there’s a bench at around the halfway point, where you can wrestle with other visitors in a sweaty attempt to rest your feet. On the way down, I met some friendly local sheep and we were able to climb across the rock across from the bench and look out across the cliffs. Once arriving in the village, we saw Meinir’s tree, which tells the story of, who I’ve decided are the Welsh equivalent of Romeo and Juliet (in the loosest sense). It’s a sad tale of death and lightning, which almost certainly will have you living in fear of venturing outside your front door during any storms. The Heritage Centre was converted in 2003 from the village’s original Chapel (Capel Seilo), and offers visitors a detailed history of the site from its inception to the present day. The building itself is constructed of stone and now has a modern twist. On the day of our visit, the front was a riot of coloured flowers and hanging baskets. Also on site sit two rows of cottages, which date back to 1878. The Quarryman’s Cottage is open to the public (free of charge, as with the Heritage Centre). It has been restored to show how the Quarrymen would have lived in 1910. The Village Café is a lovely spot for lunch and also serves alcohol. Unfortunately, I didn’t want to render myself physically unable to make the climb back to my car, so I refrained. Continuing past the Café and its outdoor seating area, you can follow a winding road to the beach. This was populated with holidaymakers flying kites and sitting around a campfire. It’s another gorgeous spot for a walk and for taking photos to post on Facebook to make all your family and friends back home jealous of your new surroundings. After walking slightly faster back from the beach in order to avoid aforementioned scary mountain beast/feral mountain goat, we had to make the long pilgrimage back up the incredibly steep hill. We didn’t even stop at the bench. That’s how tough we are. Alternatively, it could be just that I wanted it over and done with as soon as humanly possible. I’m going to go for the last one. It was completely worth it, though! 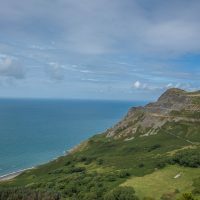 Have you visited Nant Gwrtheyrn and survived the hill? ?